Post-Research Ethics Analysis (PREA) is a research project investigating ethical issues in health research in humanitarian crises. It aims to identify good ethical practice from lessons learned in the field and develop a tool that assists reflection on ethical issues in humanitarian research. The PREA tool will provide researchers and other stakeholders with a pragmatic tool that assists learning lessons about the actual ethical challenges that develop during health research in humanitarian crises. The PREA project is based on the assumption that research ethics needs to go beyond ethical approval mechanisms and support ethical practice during and after research projects. The PREA mechanism will be easily implementable and will require minimal resource allocation. The knowledge gained through development and application of the PREA tool can be shared within local, regional and international researchers and ethics bodies, enabling wider awareness of specific ethical challenges in humanitarian research of various methodologies conducted in different settings and regions. 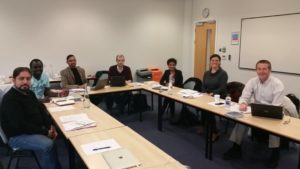 The PREA Researcher Qualitative Training took place at Anglia Ruskin University, UK on November 6-8, 2017.